A computer hacker whose goal is to discover the reason for human existence continually finds his work interrupted thanks to the Management; namely, they send a teenager and lusty love interest to distract him. I’ve always had a bit of a love/hate relationship with Terry Gilliam’s work, loving the likes of ‘Brazil’ and ’12 Monkeys’, whilst finding ‘Fear and Loathing in Las Vegas’ absolutely excruciating. 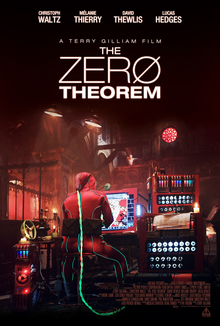 So it’s perhaps surprising I really didn’t enjoy ‘The Zero Theorem’ despite its tonal similarities to the latter two films. The film follows Qohen (Christoph Waltz), a reclusive computer genius who is working on a formula to determine what the meaning of life is. The concept is interesting, and Waltz is outstanding as we’ve now come to expect, but the film overall felt like a collection of interesting ideas which never fully develop. There’s a focus on an unusual relationship Qohen has with a women called ‘Bainsley’ (Melanie Thierry), regular visits from the teenage son of management called ‘Bob’ (Lucas Hedges), and an intuitive psychiatry programme fronted by Tilda Swinton, which all create interesting scenarios but ultimately they don’t amount to much. It’s interesting to compare the film with ‘Brazil’, as that also focused on a similarly overblown dystopian future, and Waltz’s Qohen is a kindred spirit of Jonathan Pryce’s Sam Lowry from that film, both gradually losing their minds as the world gets crazier around them. In that film, I felt fully invested whereas I found it a lot harder to get into this. There are elements to enjoy, from the interesting and wacky production design, with street adverts everywhere and excessive surveillance, to Waltz’s delightfully unhinged performance. The most interesting aspect of the film is his ‘relationship’ with Bainsley (Melanie Thierry is also really good), although it never really made sense and it never really concluded. Overall, a disappointing film, although it didn’t help watching it after the masterpiece that was ‘Under The Skin’.